Check what time sunset is and at what time the city lights come on – Book the evening cruise to coincide with both if you can so you experience both sunset and blue hour on the water. We are comparing Evening Canal Cruise Amsterdam Prices from leading ticket suppliers and Try to find you Cheap tickets prices on the market. Amsterdam is famous for its scenic canals, the historic Canal Belt being a UNESCO World Heritage recognized site. this city with its 1,000 bridges, dates back to Medieval times but is most well-loved and remembered for its Golden Age when those painters whom we now consider the Masters, were inspired by the canals and the architecture that lined the banks. Admiring the city from the water at night, the city lights reflecting in the water, can give you a whole new perspective of the city than what you would see and feel during the daytime – See the city as it comes to life at night. the best way to admire the city at night. With the city lights this cruise can feel romantic but it\'s equally suitable for the whole family as well as single travellers – Everyone will feel the good vibes as they cruise down the canals soaking up all the sights. If you\'ve already taken a canal cruise in the daytime this may be too much for you as it passes most of the same sights– Best to do one or the other rather than both, unless you really really love canals and riding on boats! Your Experience With Evening Canal Cruise Amsterdam? Hop onboard and settle down in a seat to enjoy the sights of Amsterdam lit up at night as you cruise gently down the canals. With audio commentary provided in 18 languages you\'ll be able to learn all about this city and its historic canals through the Golden Age right back to Medieval times. 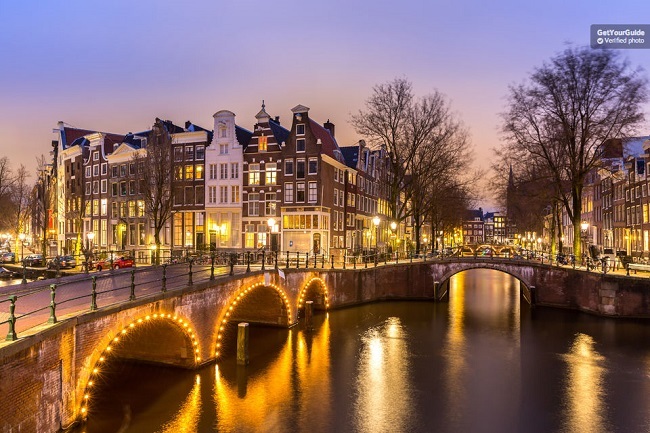 Admire the romantic bridges that are lit up at night as you sail through them and watch the elegant 17th century houses pass by as you ride through the famous canal belt including the famous \'Golden Bend\' You might also ride past City Hall, Anne Frank\'s House, the vibrant Westerkerk. the so called “Skinny Bridge", the VOC-ship, the docks, and so much more can all be seen and learnt about on this delightful canal cruise. Some of the boats (when booking through Viator or GetYourGuide) have an onboard bar selling drinks and snacks and you\'re entitled to 1 complimentary drink to make the experience even more enjoyable. the cruise ends at the original starting point. What Evening Canal Cruise Amsterdam Includes? Audio guide in 18 languages: English, Dutch, French, German, Spanish, Italian, Portuguese, Polish, Russian, Mandarin, Japanese, thai, Turkish, Indonesian, Korean, Hindi, Hebrew, and Arabic. GetYourGuide and Viator bookings receive a complimentary drink and free entry to the Holland Casino. Consider carefully which booking company to go with – Some offer a complimentary drink and onboard bar with free casino entrance afterwards – these tickets costing a little more, the cheaper cruises are just the cruise – Buy the one that works for you! In Summer you\'ll need to book the 10pm tour to ensure it\'s dark and you can admire the city lights, otherwise this is the same tour as in the daytime. Travelers Reviews about Evening Canal Cruise Amsterdam? Travellers talking about this tour on GetYourGuide, Viator, Tiqets and TripAdvisor give it, for the most part, very good reviews and say its well worth the money as it enables a different perspective of the city. People say that the staff were friendly and the boat prompt and it was a hassle free cruise along the canals. Some travellers got caught out by not booking a late enough tour and therefore essentially taking the day tour as it was Summer and not dark until 10pm so they didn\'t get to enjoy the lights. Most people enjoyed the commentary saying that it was funny as well as informative but some people did have problems connecting the headphones. Printed tickets are accepted on all boats, some operators/boats accept e-tickets but not all. Tiqets.com requires you to exchange your e-voucher for a printed ticket at the Lovers Canal Cruises shop at 25 Prins Hendrikkade street. Check if you can board using an e-ticket or if you must exchange it for a printed ticket before boarding. Intoxicated passengers will be refused entry onboard the boat. Departure point depends on booking company used, check your email confirmation but tends to be from 25 Prins Hendrikkade Or 30 Stadhouderskade.